Enlarge your capacity. Make room for the new! What an auspicious card! You are ready to move forward with your plan. This is the time to think BIG, to make room for the next phase of your endeavor, and to let it GROW. For those working on prosperity, this is a great time to free yourself from all restrictions. Imagine there are no limits to your goal. What if money, time, and resources could flow to you in endless abundance?! 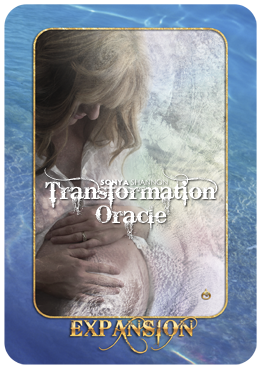 Since this card is in the element of WATER, open your heart to the feeling of limitless expansion, growth, and absolute actualization of your dream. The more you can dwell in the feeling of abundance, the more bountifully your dream will manifest! This card also shows up when people are planning to have another child. It is literally the pregnancy card, adding to your family and bringing another soul to Planet Earth, whether through childbirth, adoption, or fostering. It’s a very good omen! Again, let your heart feel the welcoming of a new child. Then remain open—and grateful—to how and when this wonderful event can transpire. If this card appears upside-down, you may be restricting what is possible out of a fear of scarcity. Time, money, energy, and resources belong to the Universe. You may need to loosen up and stop trying to own and control how things proceed. For ideas on how to get into the flow of abundance, look for other cards in your spread—especially those in the element EARTH, or pull a new card for guidance.